He won't, you know. He never has. Not since the first moment that you called His name and believed. He has never let go of you - and He never will. Oh, I can guarantee that you will; at least a few times in this journey. 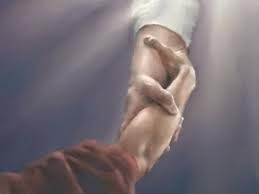 You will let go of him, fail Him, falter in some way; but He holds on. That is the only reason any of us ever make it to the end, for the sake of His strong grip. You cannot be snatched from His hand. Not stolen. Not lost. Even if you were to sink down into a miry pit, Father's hand would find you there and pull you out . . . now that is true security. We do not get to heaven because we are good sheep, we get to heaven because we have a Good Shepherd.